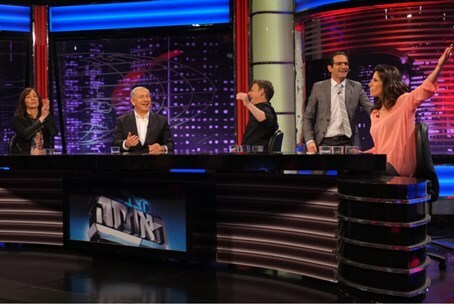 Prime Minister Netanyahu appears on satirical television show, in which he also talks about serious issues. Prime Minister Binyamin Netanyahu appeared on Sunday on the satirical television program Matzav HaUma (State of the Union), which airs on Channel 2. While much of the interview was funny, given the nature of the program, the Prime Minister also made some comments on serious issues, among which was a warning that Iran’s nuclear program is dangerous for Israel. Referring to the peace talks between Israel and the Palestinian Authority (PA), Netanyahu said that he would not be willing up to concede any territory, only to have Iran and its proxies take over that territory. Asked about recent sayings by Defense Minister Moshe Ya’alon which raised the ire of the United States and which caused the State Department to demand an apology, Netanyahu suggested it was best to talk less and do more. "Bogie is an excellent defense minister. We do an excellent job. Sometimes it’s better to do more and talk less,” he said. Finally, the issue of the media attacks on Netanyahu’s wife, Sarah, was raised in the interview, particularly in light of the latest lawsuit by the Netanyahus’ former housekeeper. "They say that being Prime Minister of Israel is the toughest job in the world. Being the wife of the Prime Minister of Israel is also probably one of the toughest jobs in the world,” said Netanyahu. Comedian Orna Banai, one of the hosts of the show, then tried to answer sarcastically, but the Prime Minister replied by telling her that he and his wife had adopted the Meatless Monday initiative, of which Banai is an advocate. "I have one request. Maybe you can define Monday as the day on which you will not attack the Prime Minister of Israel? Only one day?” he said.